May 1st, 2015 is a date that 12-year old Christina-Maria Dangelas and her mother, Joanna, won’t soon forget. After complaining about a lump on her humerus, a bone found in her arm, a routine X-ray at the Montreal Children’s Hospital (MCH) showed that Christina, a previously healthy and active soccer player, didn’t have a sports injury as previously suspected. She had a tumour on her bone. It was an osteosarcoma, which affects about 3% of children diagnosed with childhood cancer. Within a week, Christina underwent a biopsy and a battery of others tests to figure out the extent of her illness. She and her family also met with Dr. Robert Turcotte, an orthopedic surgeon and musculoskletal oncology specialist at the McGill University Health Centre (MUHC), who explained that while her tumour was barely visible to the naked eye, it had wrapped around her bone and was growing. On August 12, 2015, Christina underwent an 11-hour surgery with Dr. Turcotte to remove her tumor while saving as many nearby tendons, nerves, and blood vessels as possible to maximize her arm function. The surgery was successful, and was followed by intensive physiotherapy and occupational therapy to ensure that Christina could regain as much movement in her hand as possible. 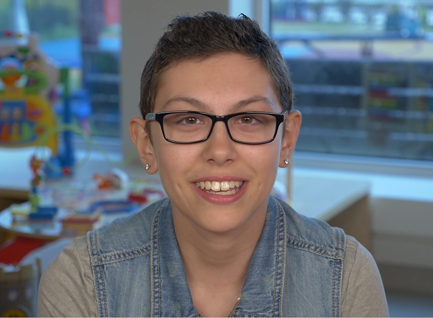 Today, Christina is finished with treatments, and has returned to life as a 12-year old girl beginning high school in Laval with all of her friends. She will continue to be followed on an outpatient basis for monitoring, but her visits are now every six weeks and will be more and more spread out as time goes on. In an effort to support the Montreal Children’s Hospital’s Oncology Department, Christina and her family launched the Christina-Maria Dangelas Fund last year, and has since raised over $7,000 thus far, thanks to support from family, friends and her dedicated classmates.